Chess and checkers are among the activities available at The Oval+. The green ellipse at the center of Benjamin Franklin Parkway, which every summer blooms into the activity-packed pop-up park known as "The Oval," returns this week under a slightly different name. The newly dubbed "Oval+" is fairly literal as re-brands go. All the favorites — beer gardens, film screenings, fitness classes, game nights, and family activities — will be back as before, but this year, the park comes with a plus: two new green spaces, an interactive art installation, and an immersive maze running the length of the park. An oversize Connect Four game at The Oval. The main new attraction is a massive and brightly colored art installation set up in the middle of the oval. The piece, designed by Philadelphia- and Chicago-based firm PORT Urbanism, aims to celebrate Philadelphia icons and greenery, while initiating dialogue about the future of the Parkway. Onlookers will find three chambers distinguished by color (yellow, pink, and green) and purpose (icons, greenery, dialogue). "The yellow room is the dialogue room," says Ellen Ryan, senior director of strategy and planning for Fairmount Park Conservancy (which partnered with Philadelphia Parks and Recreation to organize the four-week Oval affair). "This room is about having a conversation and asking why people come to the Parkway — what do they love about it? What would make them come more often?" With the Parkway's centennial approaching in the fall, Ryan says the voices of Philadelphians will have a real impact on how the city approaches public programming in the future. "The pink room is culture and recreation," Ryan says. "We have some of the iconic people of Philadelphia that we want to celebrate, including Dr. J, Billie Jean King, Questlove. You'll see see their imagery and totems that are about 24 feet high all together. They'll light up at night, so you can see this installation at all times of the day." Fitness classes are part of The Oval, which runs through Aug. 20. The "green room," like the Oval+ rebrand, stays true to its name. "We're going to have some greenery," Ryan says. "And some horticulture from Greenland Nursery — the nursery on-site at Fairmount Park." 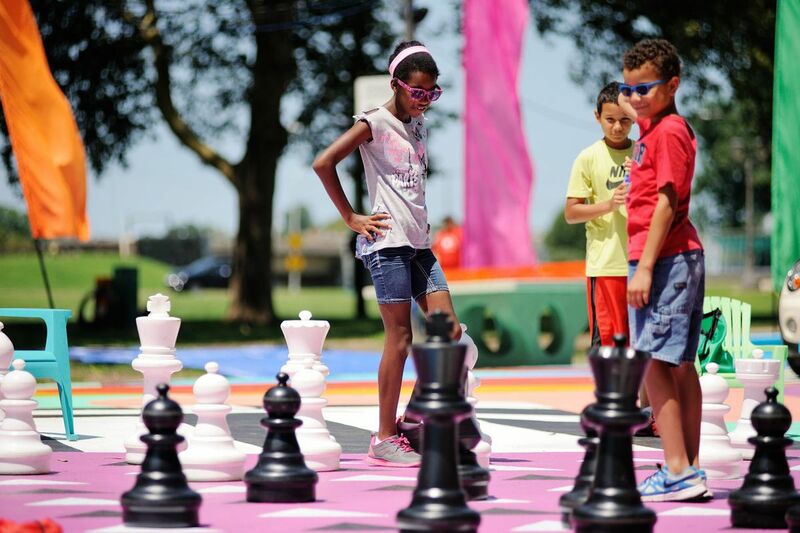 In addition to the installation, the park will feature giant outdoor chess, a splash park, food trucks, and a Thursday night dance party starting at 7 p.m.
Ryan says the plus is not only geographical, but also includes the Oval's two new partners, The Free Library and the Franklin Institute. "The library is celebrating the reopening and expansion of Shakespeare Park with a jazz series on Thursday evenings and an interactive story hour for families and children every Saturday," Ryan says. "They also have one really special event, which is Saturday, Aug. 19. It's Julius Caesar, a live radio play, which is done with Revolution Shakespeare, a terrific company in Philadelphia." The Oval+ runs until Aug. 20.